Au 2014 scholar from Courtney rayes on Vimeo. This entry was posted in Internship Journeys on November 30, 2014 by admin. This entry was posted in Internship Journeys on November 25, 2014 by admin. Lee H. Somers, Ph.D. Director Emeritus, Our World-Underwater Scholarship Society®Dr. 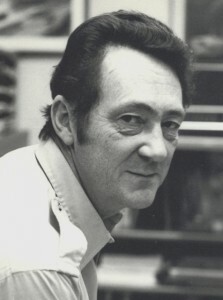 Lee H. Somers passed away quietly on New Year’s Day 2015 in Flagstaff, AZ. Lee was born on February 18, 1938, in Champaign County, IL, and raised on a farm there. He discovered his love of water and knack for teaching in Boy Scouts, becoming an Eagle Scout. After working as a commercial hard-hat diver in Florida, Lee earned a Master’s degree in Geology from the University of Illinois and a Ph.D. in Oceanography from the University of Michigan. He was on the University of Michigan faculty for 30 years, teaching oceanography, scuba diving, and diving technology, while serving as the university’s Diving Safety Officer. He also established a hyperbaric chamber for treatment and research at the University of Michigan. Lee was deeply involved in improving diving safety for recreational divers, public safety search and rescue personnel, and commercial divers. To this end, working with the NOAA-National Sea Grant Program, he gave countless presentations and field demonstrations across the country, and wrote dozens of books, papers, and leaflets. In 1972 Lee wrote the Research Diver’s Manual, used worldwide. He was a major contributor to the NOAA Diving Manual, the research text for all working divers and diving scientists. Lee was a founding member of PADI (Professional Association of Diving Instructors), a founder and first president of the American Academy of Underwater Sciences, and a founding director and Director Emeritus of the Our World-Underwater Scholarship Society®, which provides experiential year-long Rolex scholarships worldwide to graduates studying ocean sciences and arts. Lee received many prestigious national awards, most recently the 2013 DEMA Reaching Out Award for Education. Lee helped shape the way the world dives, and he was an inspiration and mentor to many. Lee retired to Flagstaff, AZ, with his wife, Martha, who survives him. After a relaxing day off and some turnover in personnel, we’re ready to start week two of fish blitz. Sunday was our off day to recuperate and off-gas (allow any residual nitrogen to exit our bloodstream). After bringing leavers to the ferry and enjoying huevos rancheros at JJ’s Texas Coast Café, we wandered around town and browsed the shops. 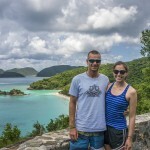 Later, Rob took NOAA research associate Lee Richter and me on a scenic tour of the island to check out the beautiful beach lookouts, followed by pickup beach volleyball with the locals in Cinnamon Bay. It was a great scene—despite the high level of play everyone was friendly and welcoming, and we would cool off and de-sand in the clear, refreshing water between matches, striking up conversations with fellow waders. 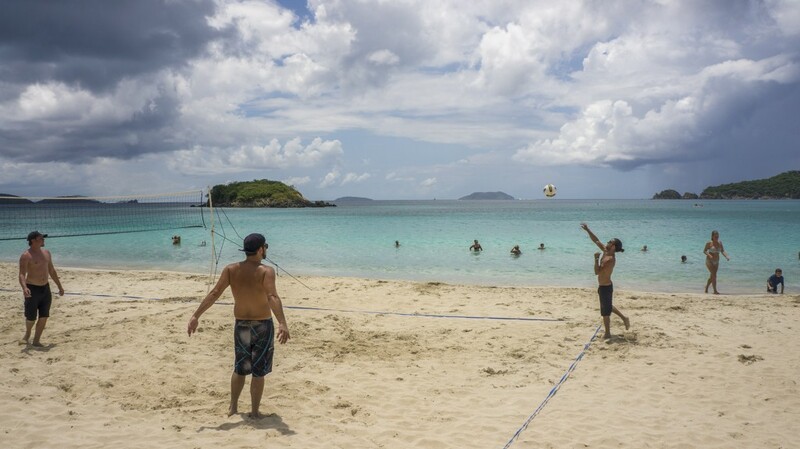 St. John locals gather to play pickup volleyball every weekend on Cinnamon Bay beach. On Monday, the surveys proceeded as usual, although this week Mike moved me around to different boats, so I had a chance to chat up different people and learn the quirks in operating culture and inside jokes of each boat. I’m feeling good about fish identification, so Mike briefed me on an alternate fish count method, Reef Visual Census (RVC). Rather than moving forward along a transect line, the diver stays at a fixed point, noting the species and number of all fish in a 7.5m radius cylinder stretching the height of the water column. The species and number of all fish are recorded for five minutes, and then only new species that enter the cylinder between five and ten minutes are recorded, and then only new species between ten and fifteen minutes. 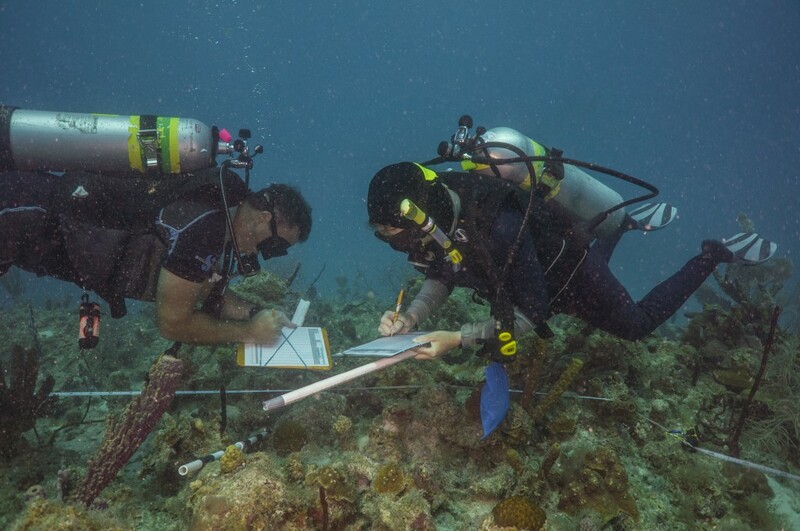 At the end of the survey, the diver writes down the average size of each species, as well as a minimum and maximum. The fish blitz group has been using RVC surveys as a means of calibrating fish counts, and they’re comparing the two methods for efficacy and accuracy. 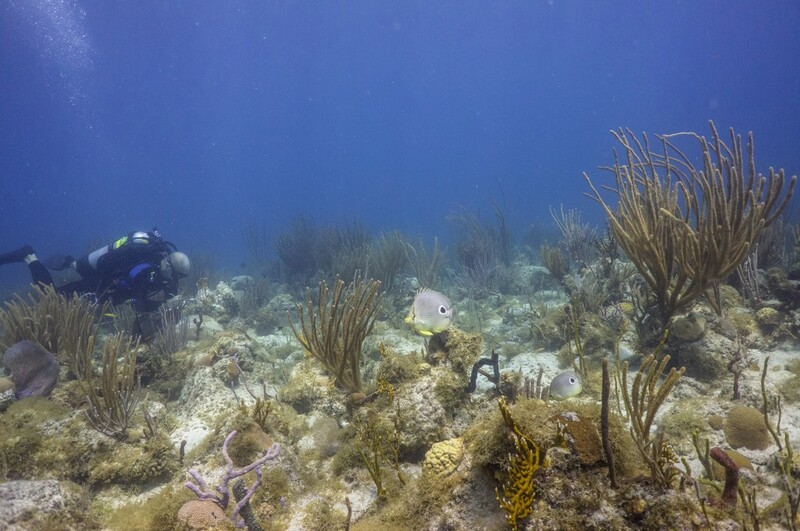 So far it appears that divers counting along a transect can better see and identify small fish, while RVC divers tend to catch more of the larger fish. A school of horse eye jacks passes over the mid shelf reef. I’ve felt much more engaged with the dives with an actual data sheet in hand. On my first survey, I busily scribbled down all of the species flitting around directly below me for a full 30 seconds before I remembered to look up and around me. My already questionable underwater handwriting soon deteriorated into a frantic scrawl as I realized just how much bigger 7.5 meters is than 4. On the surface I compared notes with the official fish diver to see if we were getting similar species and sizes. Everything looks bigger underwater, so I learned to be careful not to exaggerate fish size. In all of my previous diving experience, I’ve been moving constantly to explore a reef or follow a transect, so it was a new experience to stay completely still for fifteen minutes. I would wait a while to begin my survey as I recorded information about the site, date, time, and conditions, and fish that retreated upon my arrival would reemerge, and some curious individuals would approach or swim by several times. A few minutes into most surveys I would find a red hind peering at me from behind a soft coral, observing me for duration of the count. I did find that I was more attuned to larger fish passing by and the schools of silvery fish that flashed overhead than I had been with previous transect experience, while smaller fish near the periphery of my cylinder were more likely to escape me. We had more weather related excitement this week: Wednesday brought winds and rain that developed into thunderstorms by midday. The seas were rough and we had a few sites with ripping current, requiring substantial effort to stay on the transect. 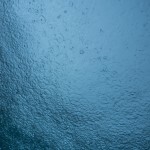 As we came up from the second dive I was mesmerized by the sight and sound of raindrops from below surface of the water, something I’d never experienced before. 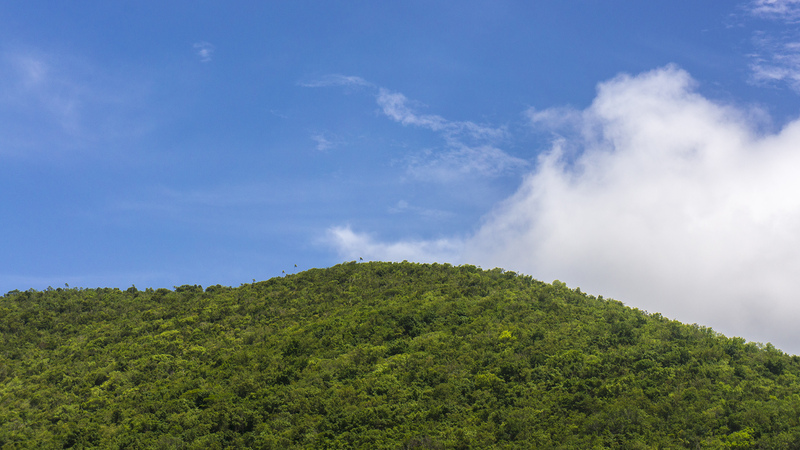 Storms dramatically wreathed the slopes of nearby Tortola, and as lightning forks drew closer we tucked into a protected bay to wait out the storm. For the rest of the day we dodged intermittent squalls, being careful to avoid diving near lightning. The reefs are muted and peaceful in the rain, and I was reluctant to leave the warm water for winds and waves on the surface. There have been a few other breaks in routine, especially with all the boat shuffling. 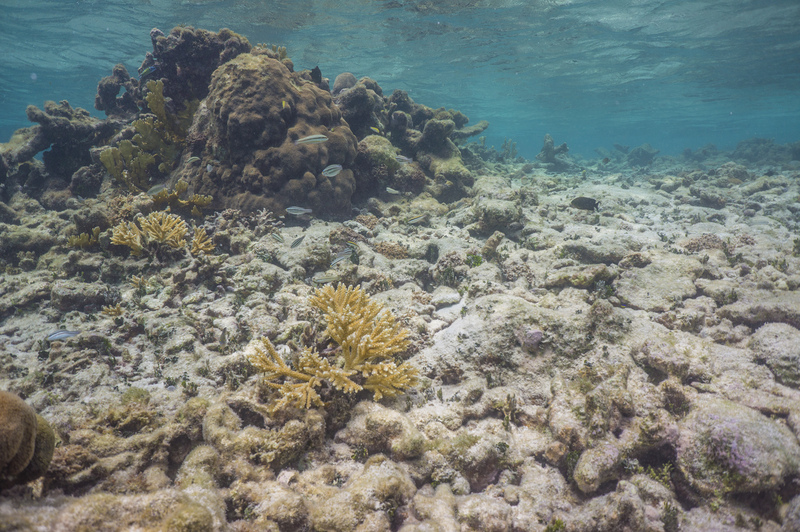 On my last day on Stenopus Rob brought us to a shallow, clear site in No Name Bay for a brief dive/snorkel to check out a patch of Acropora prolifera, a hybrid of endangered corals A. palmata and A. cervicornis. Margaret, an Acropora expert, was particularly delighted to see the unusually branching colonies. On board the boat Acropora, we made an excursion to St. Thomas to refill nitrox tanks (nitrox is an oxygen-enhanced mix that allows longer dives at depth), so I had a brief chance to explore Red Hook harbor. NPS science tech Adam Glahn explores the prolifera patch in No Name Bay. After two weeks I’ve become well versed in St. John’s restaurant scene. We went into town for dinner almost every night, with the exception of a group pizza night or two and the evening when SFCN I&M Coordinator Matt Patterson cooked us a spectacular pasta dinner. Many members of the team have been to St. John several times for fish blitz and Rob lived and worked here for years, so they know all the best spots, from delicious barbecue at the Barefoot Cowboy Lounge to Rhumb Lines pad thai and key lime pie for NOAA scientist Susie Holst’s birthday celebration. Often, coral talk would continue over dinner, with rapid-fire exchange of Latin names and proud comparisons of who had found the most Diadema. 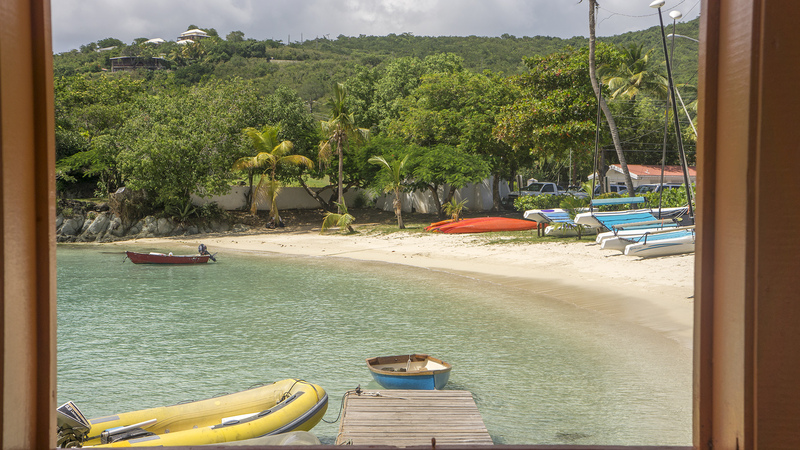 A last view of Cruz Bay through the ferry terminal window. Thanks so much to Mike for coordinating my experience here and a holla to Rob for being a great island guide. Thanks also to everyone for working with me, driving me, feeding me, hanging out with me, and imparting wonderful advice! It was wonderful to meet you all. This entry was posted in 2013 National Park Service on August 6, 2013 by admin. 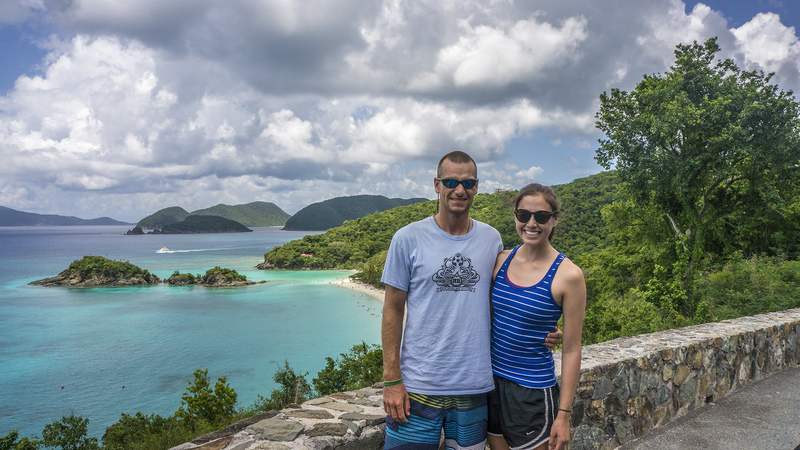 Good afternoon from Virgin Islands National Park on St. John! 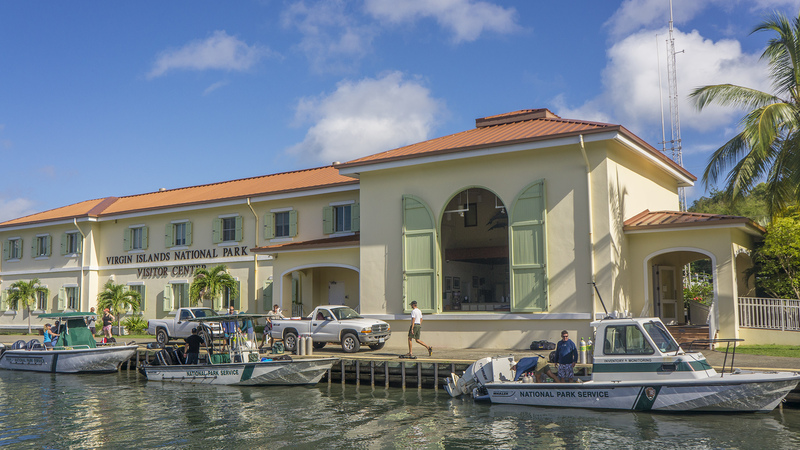 I’m here for two weeks of “fish blitz,” a collaborative, multi-agency effort to survey and monitor fish and benthic communities in the US Virgin Islands. The Virgin Islands National Park, the National Park Service South Florida/Caribbean Network Inventory and Monitoring office, NOAA, Nova Southeastern University, University of Miami, University of the Virgin Islands, The Nature Conservancy, and the Virgin Islands Department of Planning and Natural Resources have been working together for over a decade in the Virgin Islands to map the benthic habitat around the islands and document long term trends in fish and coral populations. This is an all-star team of distinguished experts in their fields, and it’s an honor to be here working with them. NPS I&M ecologist and my coordinator Mike Feeley met me at the Miami airport and we were coincidentally seated next to each other on the flight to St. Thomas. We stayed in the airport for some time as the team of scientists, recognizable by their bags of dive gear and jovial greetings, aggregated by the baggage claim. This is the first year surveys are also being conducted on St. Thomas, so there was much reshuffling of gear and discussion of logistics as we sorted out who and what would go where. Eventually the St. John crew assembled and hopped on the twenty-minute ferry to the 20 sq mi, 5,000 person island that would be our home for the next two weeks. The Virgin Islands are a sharp contrast to the smooth topography of the Florida Keys: steep green mounds rising abruptly from the ocean, dotted with cactus and spindly, windswept palms we affectionately call “Truffula trees.” As we arrived in the colorful town of Cruz Bay, which sported residual decorations from the Carnival celebrations that had ended two days previously, the skies opened with drenching rains. 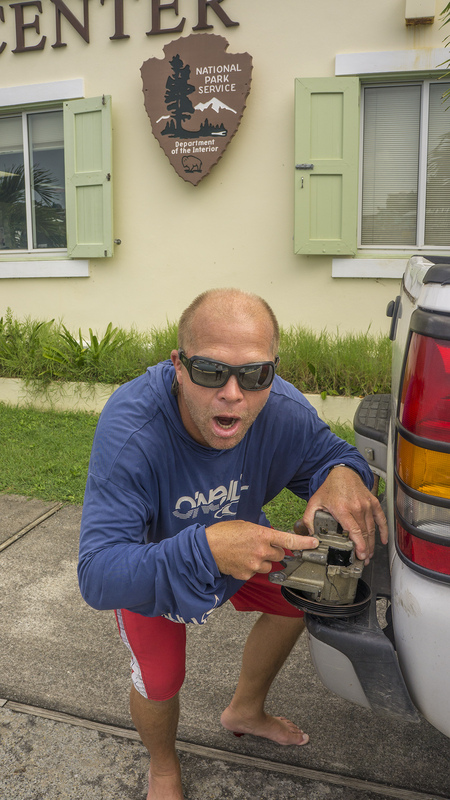 Rob Waara, another I&M scientist, picked us up at the dock, and careening up and down mountainous, narrow roads, and around impossibly sharp curves in the downpour was an exciting first introduction to the island, all the more so because we were driving on the left side of the road. Staying in housing with the team, I’ve enjoyed the chance to get to know some of the scientists and hear about their different agencies, and participate in group dinners and data entry activities. 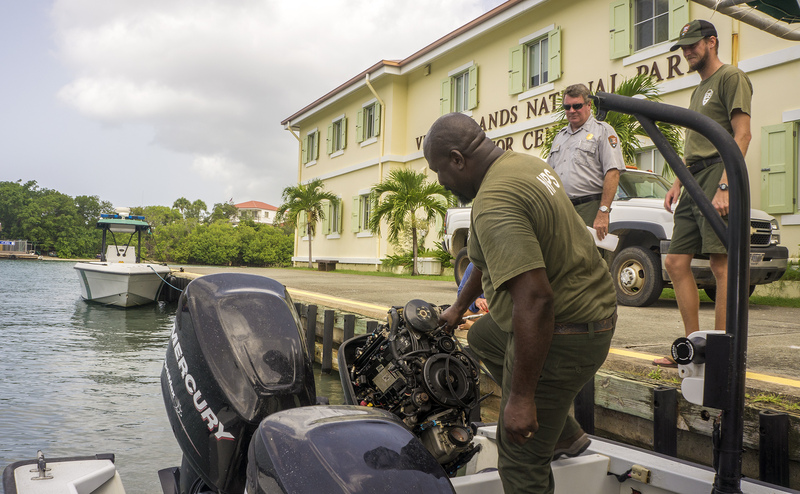 Each morning we cram into our rented SUVs and zoom up and down to the National Park offices, known as the Biosphere (short for Virgin Islands National Park Biosphere Reserve). In the absence of heavy rains the roads are no less eventful as we dodge hidden speed bumps and the dogs, cats, donkeys, chickens, iguanas, mongooses, and people that roam nonchalantly in the streets. 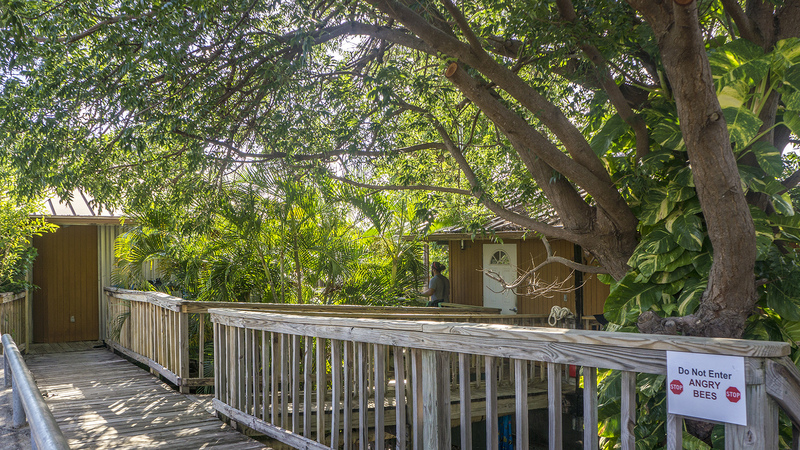 At the Biosphere we discuss site assignments for the day and gather gear, which we drive down to the dock and load on the NPS boats Acropora, Leatherback, and Stenopus. 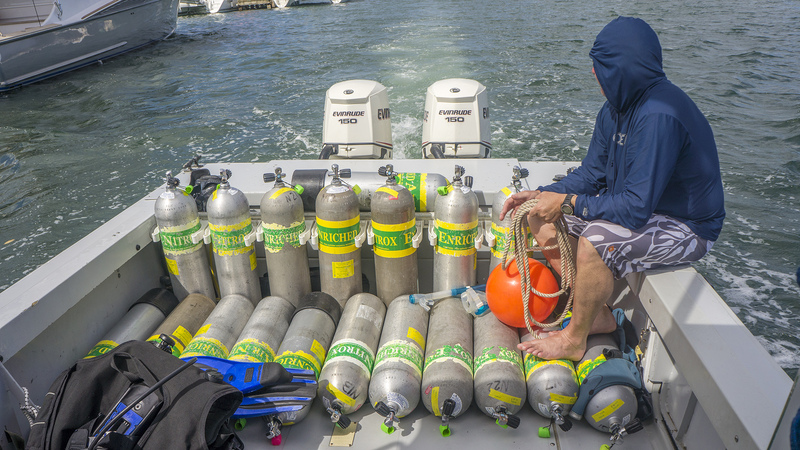 We take everything we need for a full day of surveys, usually five to seven or even eight dives: an exhausting day. The nature of coordinating fifteen researchers and three boats has given me ample opportunity to nourish the local mosquito population. 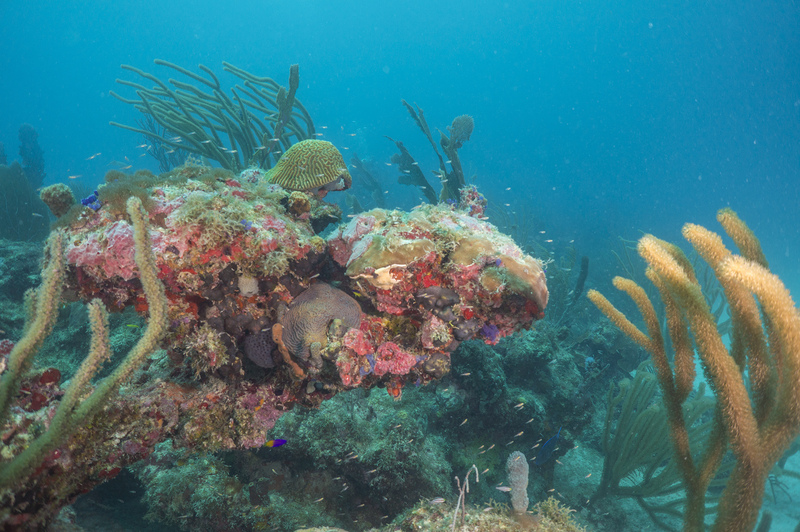 The surveys are conducted at randomly selected sites all around St. John, and we record data on the type of benthic habitat, coral populations, fish populations, and water quality. The three main surveys for this project are fish counts, LPI, and demo. For fish counts, a diver spools out a 25m transect in a random compass bearing and records the number and species of all the fish he or she sees on two meters either side of the line and up the height of the water column. For certain indicator species, like snappers and groupers, the diver also records length in 5cm increments. 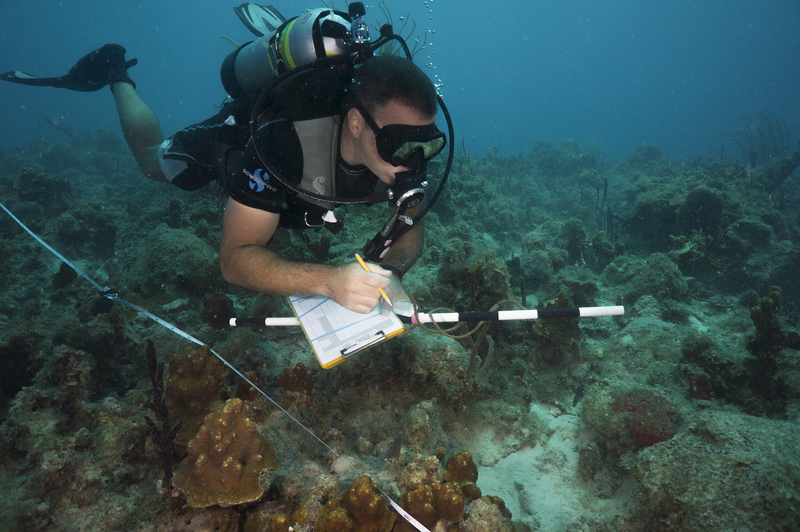 LPI stands for line point-intersect, and this diver records what is present on the benthic (seafloor) substrate on 100 points in 20cm intervals along the 25m transect line. 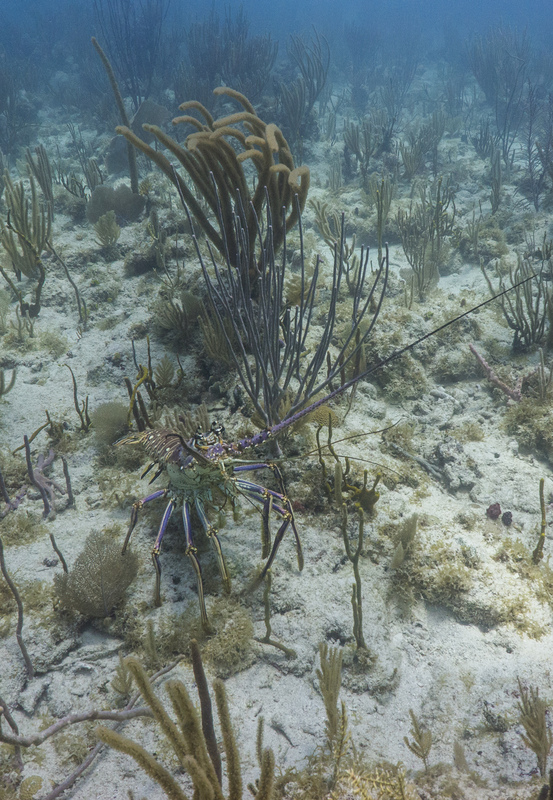 Afterward, he or she also notes the presence of certain endangered species of coral, and spiny lobsters, Diadema urchins, and queen conch within 2m on either side of the transect line. 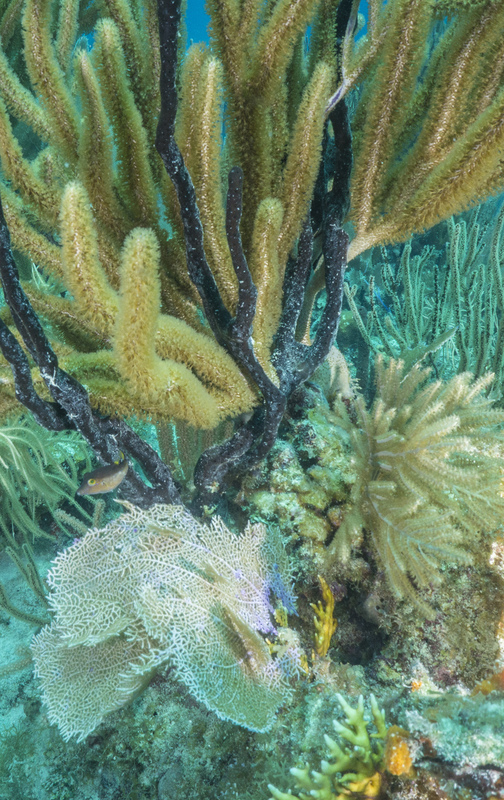 Demo, short for coral demographics, consists of identifying and measuring the longest diameter, perpendicular diameter, and height of every coral structure greater than 4cm on a 10x1m transect. 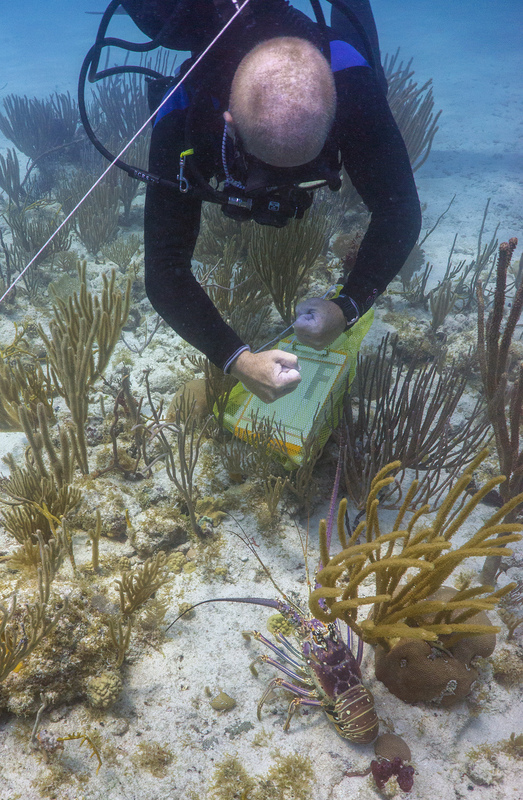 The demo diver also records the percent total and recent mortality on each coral structure, and the presence of bleaching. Mark and NOAA ecologist Margaret Miller work together to finish a demo survey. I’ve been on Stenopus with Rob Waara, NOAA Biogeography branch scientist Mark Chiappone, NOAA Southeast Fisheries Science Center ecologist Margaret Miller, and Virgin Islands National Park science tech and boat driver extraordinaire Adam Glahn. We were originally assigned all demo surveys since they are typically the most time consuming, but by midweek incorporated LPI and fish counts as well. Virgin Islands National Park Natural Resource Manager and Park Dive Officer Thomas Kelley was kind enough to lend me his fish guide to brush up on species identification, so I’ve been shadowing Rob on fish counts in hopes of contributing to data collection later in the trip. Diving for a field mission like this is very different from recreational diving or even the routine work diving we did in Biscayne. These scientists have limited time and resources in the field to collect as much and as rigorous data as possible, and are straight to business underwater. 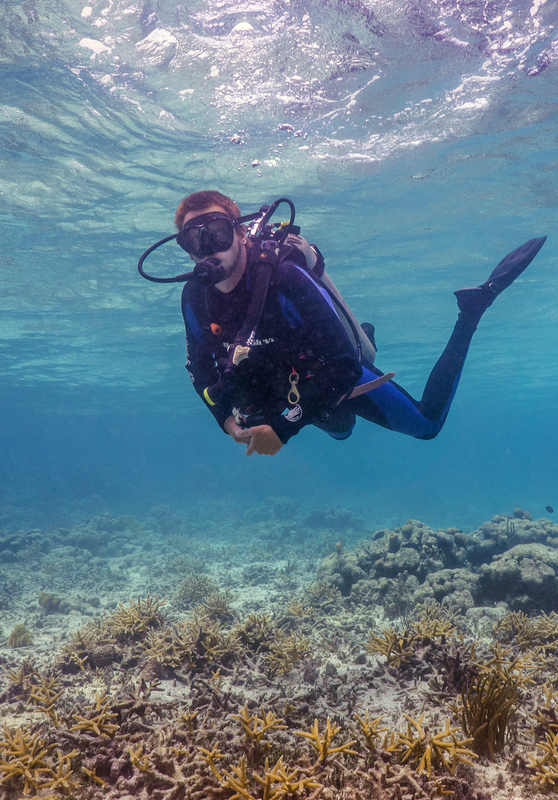 Intensive, repetitive diving across multiple days is taxing and risky: in addition to the usual concerns of diving (buoyancy, air consumption, paying attention to one’s buddies, dealing with conditions like high currents or low visibility, etc.) 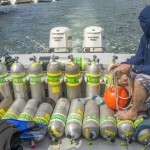 and the mental exertion of measuring dozens of small corals or tracking fast moving and often similar looking fish while following standard operating procedure for the surveys, these scientists must be aware of how previous dives affect their blood oxygen and nitrogen content, which can constrain the length of a safe dive. Our mantra “safety before science” is of the utmost importance, and sometimes we’ve made the tough but conscientious decision to end a dive mid-transect to stay within safe decompression limits and make sure everyone gets to the surface together. I certainly struggle to focus on even simple tasks underwater—there’s so much to think about and look at, even before the nitrogen narcosis sets in—so I’ve been extremely impressed by the professionalism and efficiency these scientists exhibit on every dive. 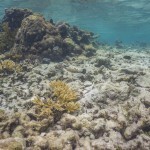 My focus on fish species has made it painfully apparent how depleted the populations are here. 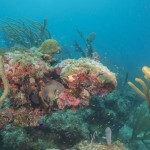 Particularly noticeable is the absence of large predators: snappers are few and far between, and groupers nonexistent. The few fish we do see are the usual prey base for these larger predators, what we in the scientific community refer to as “little dicky fish.” I’m getting tons of practice identifying the various intermediate stages of juvenile wrasse and parrotfish, and the dickiest fish of them all, Halichoeres bivittatus. 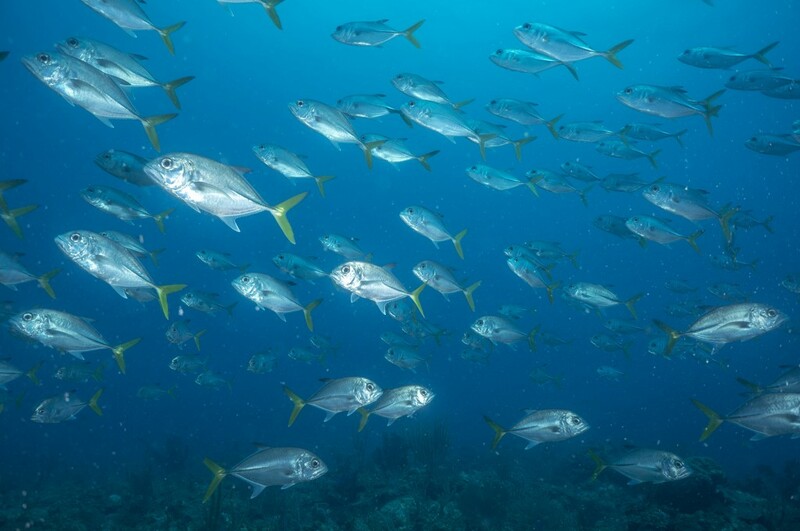 The loss of large groupers and snappers, undeniably tasty fish, is a definite sign of overfishing. 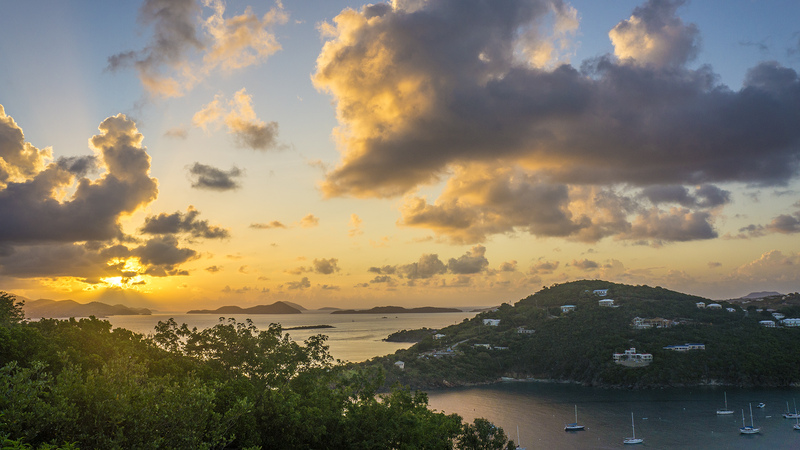 Although most of St. John and its surrounding waters are protected by Virgin Island National Park and Virgin Islands Coral Reef National Monument, recreational fishing is allowed, and the park just doesn’t have the resources to control illegal commercial activity. Rob Waara conducts a fish count. The loss of large top predators is problematic for marine ecosystems because larger fish are generally more fecund, and because they are often keystone species that regulate the food web. Without them the ecosystem is unbalanced, with consequences cascading down trophic levels. 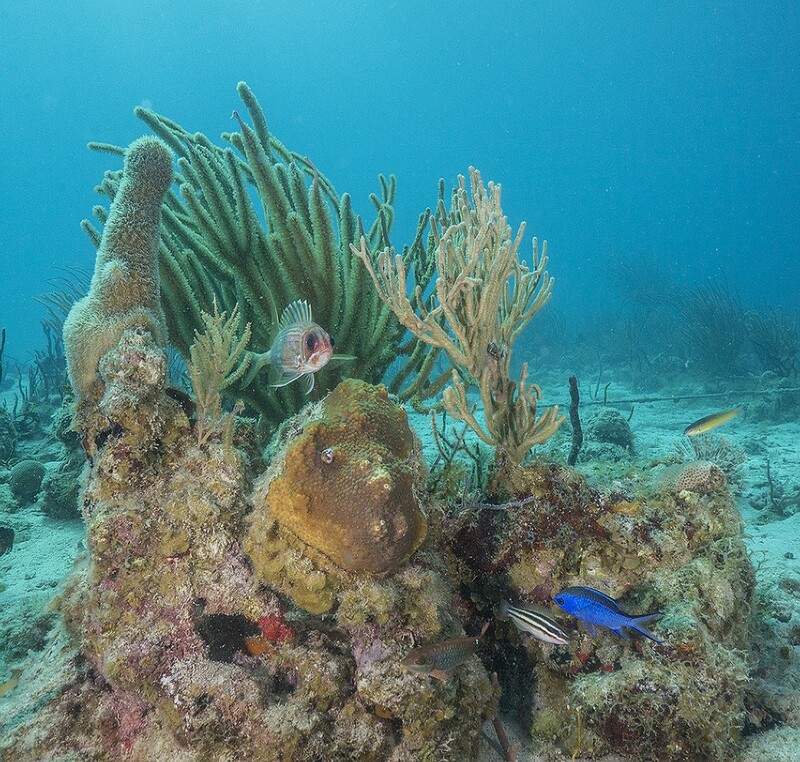 To make matters worse, this area is a hotspost for ciguatera, a toxin in reef plankton that bioaccumulates in fish and causes severe neurological symptoms in humans. Large fish at higher trophic levels have more ciguatera toxin in their tissues, and thus are more dangerous to eat. These big predators here have been unsustainably fished and they aren’t even edible! Encouragingly, I haven’t seen a single lionfish, but they do live here, and an overfished, unbalanced community like this will be more vulnerable to their inevitable invasion. This week has also had its share of the adventures and obstacles inherent to field work. As a rookie intern I’ve found our escapades exciting and amusing, but to these seasoned scientists they seem more routine. 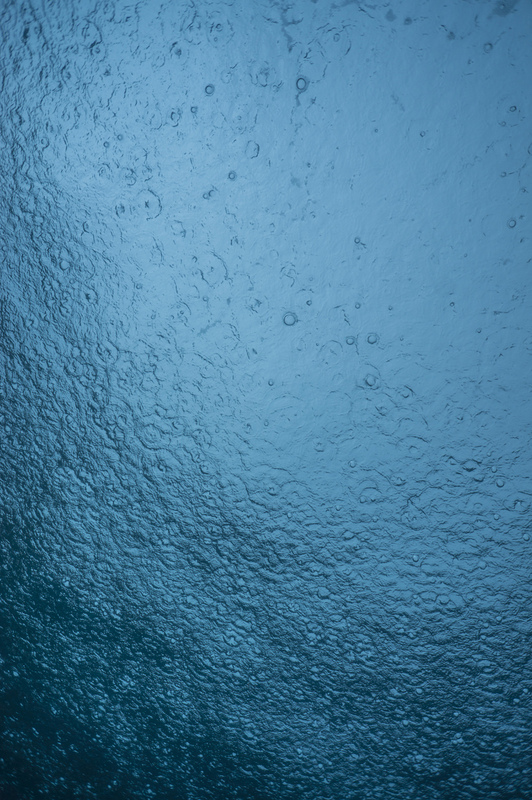 We had rough seas on the first few days, and waves would slosh through the dive door as we returned to the boat, overwhelming the bilge pumps. It was definitely a new experience to be assembling my gear while standing in a foot of water in eight-foot waves. Midweek, as we apprehensively followed wind forecasts, I was worried that tropical storm Chantal would bring me another lesson in weather-dependency, but she passed to the south of us and we took advantage of St. John’s complex geography to find protected sites, and actually had great conditions. The next day it wasn’t weather but equipment that stymied us: just past the harbor, our port engine emitted a fractious outburst and refused to take us further. Our assigned sites were all the way around the island and we didn’t think we could make it on one engine, so we headed back to the dock. Fortunately the park’s mechanic Peter was on site, and discovered that part of the compressor had exploded, leaving a golf ball sized hole. Luckily he had an extra on hand and we were soon underway, and were still able to finish five sites. The camera has been an adventure in itself. A few minutes into my first dive of the trip, I glanced down to a horrifying sight: a small pool of water collecting inside the dome port! Luckily it was a shallow dive and I was able to pop back up and hand it off to Rob and Adam on the boat. After a careful fresh water rinse, overnight blasting with AC, and some O-ring grease, the camera is fully functional, to my immeasurable relief. I haven’t had any more flooding scares, and am hoping this means I’ve gotten them out of my system. In the deeper and less clear waters here I’ve been experimenting more with the strobes, with mixed and sometimes frightening results. Everyone has been extremely patient and tolerant of me flashing haphazardly in their faces in my attempts to snap glamour shots. I’m absorbing all the advice I can get and hopefully will improve via trial and error over the next week. The next week will bring some new people and reportedly smooth conditions. I’m excited for more diving and hope to get in on some data collection! A longspine squirrelfish eyes me warily.